Make sure your doors open and close smoothly and safely with use of our hinges. Featuring a strong and sturdy construction, complimented by a high quality and attractive finish, each hinge offers durability and will stand the test of time without becoming sticky, squeaky or loose. Made from stainless steel, you don't have to worry about rust or wear and tear. 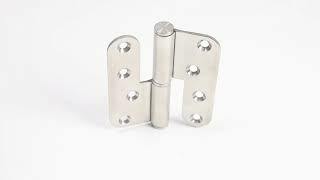 This item features a lift-off hinge type design and has a professional and attractive polished stainless steel finish.